The name Australopithecus, meaning “Southern Ape” was coined by Raymond Dart in the 1920’s for the very first specimen of the species ever discovered. 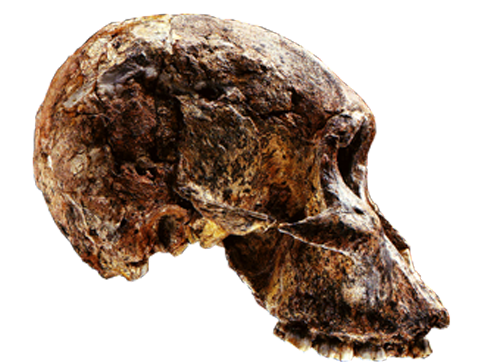 Australopithecus discoveries reveal a variety of habitat types in eastern, southern, and central Africa dating from approximately 4.2 – 1 mya. This genus is typically thought about as a species of bipedal apes with small bodies (64 – 100 lbs), small brains (340 – 500 cc), moderately prognathic faces, and a mosaic of primitive and derived craniodental anatomy (Stanford). The “Southern Ape of the Lake” was announced in 1995. Discovered by a team led by Meave Leakey at separate sites near Lake Turkana, Kanapoi, and Allia Bay these fragments consisted of a tibia, teeth, and a partial mandible. This species provides the first evidence of bipedality (Stanford). The tibia is more robust at both the distal and proximal ends, which is the area of greatest stress in the bipedal lower leg. The area of the tibial plateau is also enlarged as a result of the greater amount of weight bearing provided by bipedality. A. anamensis’ teeth and jaws display some primitive characteristics such as a U-shaped dental arcade, large canine teeth, slight shearing complex, and a sectorial (compressed from side to side due to its role as a shearing surface for the upper canine teeth) premolar (Fuentes). Arguably the most famous paleoanthropologic find in history, Lucy (A. afarensis) is the standard by which all early hominid anatomy is compared. In 1974, an expedition led by Donald Johanson at Hadar in the Ethiopian Awash Valley uncovered the fossilized remains of an approximately 3.2 myo female skeleton. “Lucy” (named so after the Beatles song “Lucy in the Sky with Diamonds”) has a mosaic of anatomical traits featuring both human and apelike features. 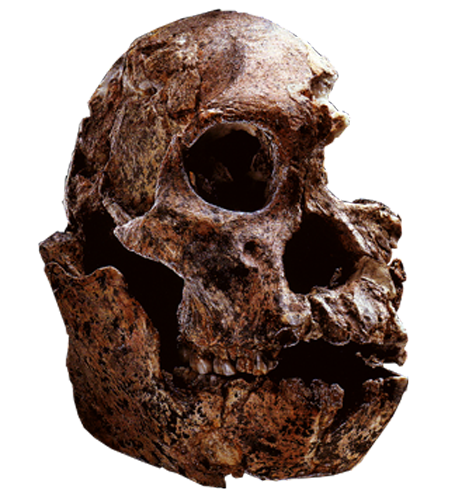 She was the most complete and primitive fossil hominid discovered to that time (Stanford). Represented by fossils making up over 70 individuals from at least 6 different sites in east Africa, this species existed from about 3.9 – 2.9 mya. A. afarensis shares a number of primitive traits with Ardipithecus and A. anamensis (Fuentes). 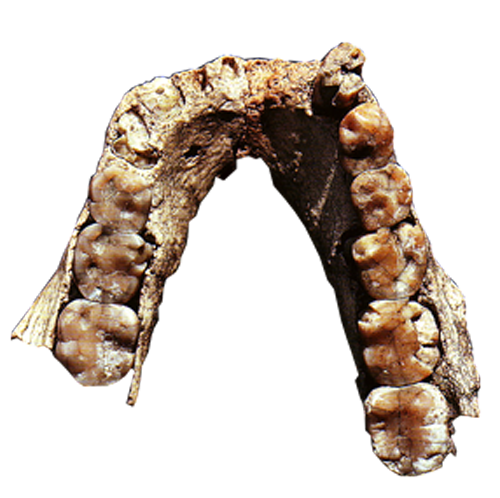 The cranium and teeth of A. afarensis are intermediate in appearance between living apes and modern humans. The face is more prognathic than modern humans but less so than apes. The dental arcade is U-shaped, the canines are fairly large, the lower first premolar is semisectorial (partially compressed from side to side due to a reduction of the shearing complex), and the tooth rows are quite parallel. The large size and thick enamel of the molars are characteristics that reflect similarities to earlier forms. The size of the cranium is relatively small with a 420 cc brain. The short pelvis and broad iliac blades which curve around the side forming the area of gluteal muscle attachment confirm that A. afarensis was a biped (Stanford). In addition the femur is angled in toward the knee which keeps the foot positioned under the center of gravity and the distal femoral condyles are enlarged with a greater groove for the patella. The tibia is more robust than in its predecessors and the hallux (big toe) is in-line with the other toes providing greater balance. The famed Laetoli footprints are thought to have been made by this species. The bones of the upper extremities are longer than those in later hominids and some researchers suggest that the phalanges are relatively curved as in earlier hominids (Fuentes). This species is believed to exhibit one of the highest degrees of sexual dimorphism with males standing approximately 5.0 feet tall weighing 99 lbs and females 3.4 feet and 64 lbs. 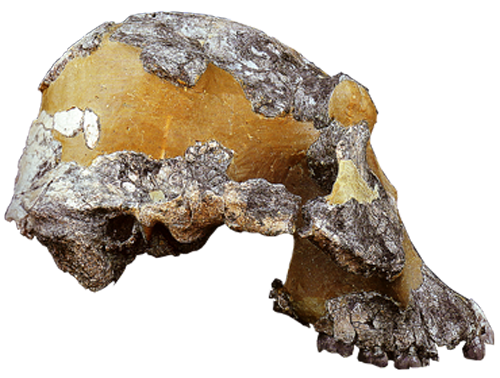 “The Hominin from the Antelope Creek” was the first of the West African hominids to be discovered. 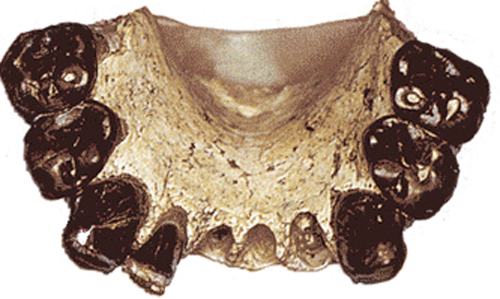 In 1995 Michel Brunet uncovered the fossilized remains of the front portion of the mandible with 7 teeth. 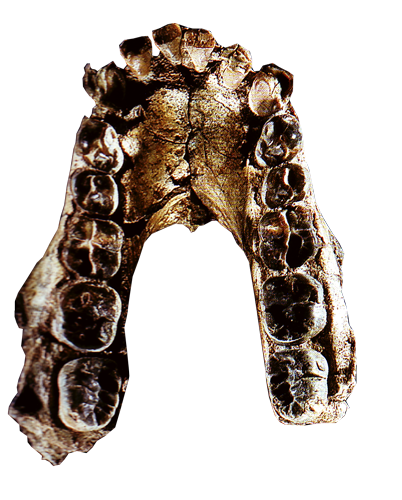 Some experts believe that this mandible from Chad in north-central Africa is a representation of A. afarensis. This find indicates that not all early hominids lived in eastern Africa (Stanford). First reported by Raymond Dart in 1925 with the publication of a description of the famous “Tuang Child” fossil, A. africanus long held a central role in the understanding of hominid evolution (Fuentes). In 1924, Dart received crates of fossilized remains collected from the Tuang limestone quarry. In these crates were the remains of a very primitive juvenile hominid. 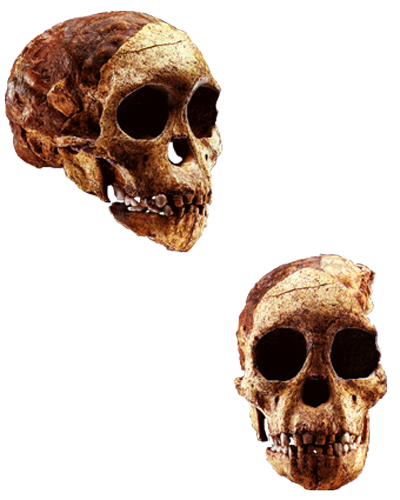 “The Tuang Child” was an apelike hominid from southern Africa and the first of its genus to be discovered, hence the name Australopithecus “Southern Ape-Man.” In 1947, Robert Broom, a colleague of Raymond Dart, discovered the partial skull of a female A. africanus in Sterkfontein, South Africa. Named “Mrs. Ples” for the genus name “Plesianthropus”, she has been estimated to have lived 2.6 mya. Compared with A. afarensis, A. africanus has a larger braincase (450 – 550 cc), a rounded vault with cranial crests, a less prognathic face, and a more flexed cranial base. A. africanus has smaller anterior teeth than earlier hominids. A. africanus had the broad and short iliac blade of the pelvis and structural adaptations in the spine, leg, and foot that characterize habitual bipedalism but it had longer arms than legs suggesting some arboreal locomotive capabilities (Stanford). A. africanus exhibited extreme sexual dimorphism with females averaging 3.75 feet and 64 lbs and males averaging 4.5 feet and 90 lbs. This species is recognized by more than 50 individuals from at least 3 sites in South Africa. 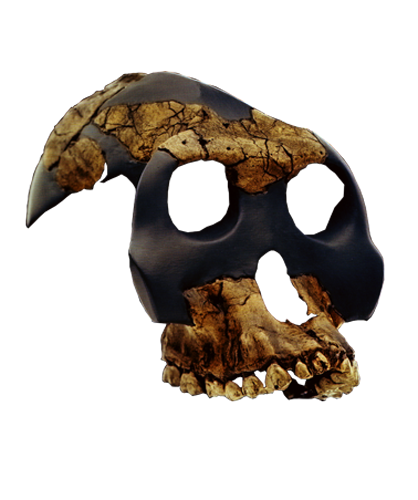 In 1999, a group of scientists reported the discovery of a new form of australopithecine at the Hata area of the Bouri geological formation of Ethiopia. They called this new find Australopithecus garhi. “The Unexpected Southern Ape from the Afar” is quite primitive, even for an australopithecine having a small brain (450 cc), a prominent prognathic face, large canines, and a sagittal crest (Stanford). A. garhi has extremely large premolars and molars; in fact they are at the upper end in size even for Paranthropines. Postcranial evidence suggests that A. garhi has more human-like proportions between the arm and leg (due to a long femur) but more apelike proportions between the upper arm (humerus) and lower arm (radius and ulna). The importance of A. garhi is its proximity to the earliest known stone tools. Archaeologists at Bouri found stone tools in association with fossilized antelope and prey animal remains in the same geologic strata that A. garhi was found, unlike any other hominid fossil (Stanford).